We break down Flagstaff's models into three categories. The first batch are all-around great campers that work well for almost everybody. The second list contains campers that are more specialized in their features and fit the needs of a smaller group of people. The last column includes campers that fit a particular niche but contain at least one design issue that leaves us scratching and/or shaking our heads. If you read this list straight-through you'll find some repetitive information for similar models or similar features. Sorry about that, but since somebody might jump directly to a particular model and not read all of this we don't want them to be lost and have to back-track. Thanks for reading! The 176 is light, easy to tow and maneuver, and is a MAC (so it has a 20-gallon water tank, four stabilizing jacks, full-perimeter door, valance, & exterior grill). It also has the largest dinette of any Flagstaff pop-up camper (including the High Wall Series). Six people can sit at the dinette! In our humble-but-awesome opinion the 176 has a much better layout and better features compared to the 176LTD (please see the 176LTD entry for more information as to why). That's why even though it was technically discontinued in 2010, we ask Flagstaff to make a special batch of them for us every year. The 206LTD layout (or a version of it like the regular 206 from the '90's or the Starcraft Starflyer from the '80's) has been around for decades and it's not surprising why: it's a light-weight camper with a well-sized dinette, a full walk-way from end to end, lots of storage space and counter space, and a galley with plenty of room to work. This is the best "basic" camper Flagstaff builds. We take a 206LTD and install a few items (like front stabilizing jacks, an overhead cabinet, and a roof valance) to make it even better. Since it's not a full MAC series camper but it's no longer an LTD unit we give it our own series name, "LT," and simply call it the 206LT. 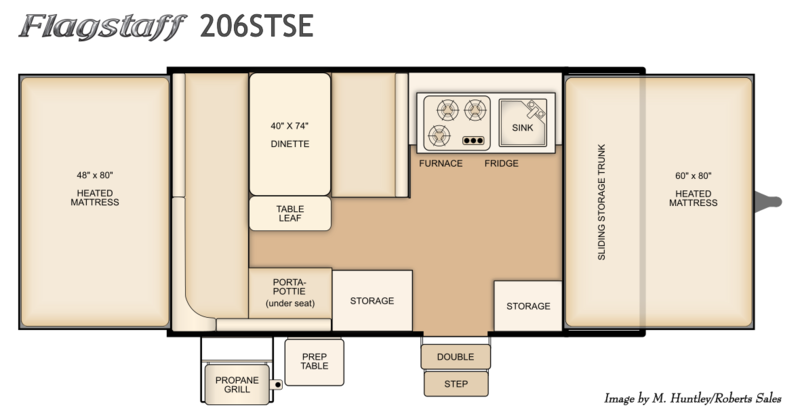 For a light and easy-to-use camper that has the most helpful features pop-ups offer (a good furnace, well-sized dinette, easy access to the beds, decent storage and counter space), there's nothing better than the venerable 206LT. For maximum seating and sleeping capacity in a small (10') package there's no comparison to the 208. 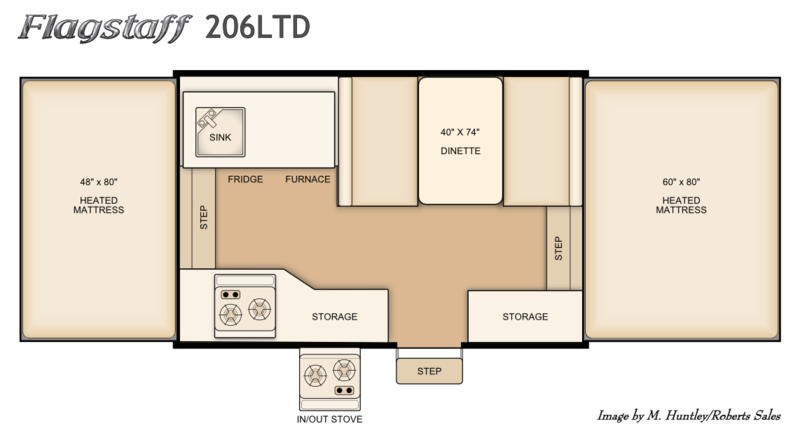 It's the only Flagstaff model with four 80" long beds. 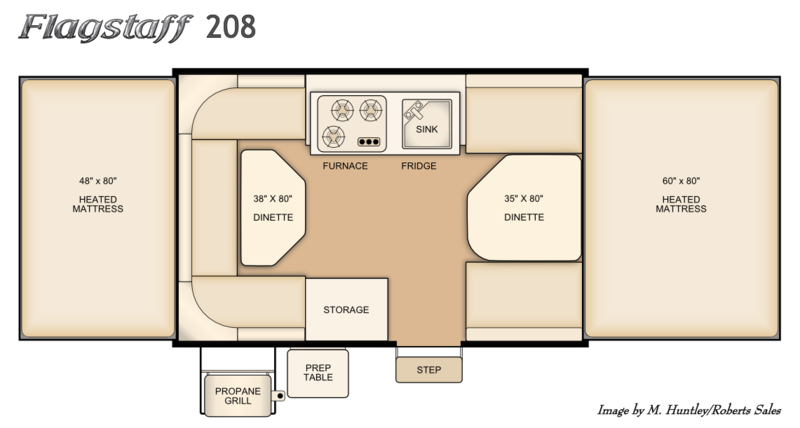 The drawback is that putting both dinettes across the width of the camper means you have to crawl over a bed or dinette to get to the end beds. If you don't need all four beds one or both of the dinette tables can be removed to provide easier access to the end beds. The 228 gets our vote for the best 12' model Flagstaff makes. It's light (compared to most of the 12' boxes), has lots of seating and sleeping space, and the galley area has plenty of floor space. A table leaf extends the table area to people sitting on the couch so the dinette area could conceivably hold 7 people. The couch also provides a nice area to sit and relax without having to slide into a dinette. Compared to the 10' boxes' 48" and 60" (Queen) end beds, the 12' boxes have longer beds by a foot in the back (Queen bed) and by 10" in the front (70" total, or what we call a "Camper King"). This is a great layout. The galley has lots of floor space for meal prep or clean-up. The "J dinette" can seat 5 or 6 people but doesn't block the rear bunk the way a full end-dinette would. The storage trunk provides a nice bit of extra storage. The 206STSE also has the big tires, stereo, roof rack, and cool color scheme of the Sports Enthusiast series. It's a great camper for heading off the beaten path. This is the excellent 228 interior with a 2' bike hauler exterior and the Sports Enthusiast package (including big 15" wheels, a roof rack, stereo, and the cool color scheme exclusive to the SE series). This is the best combination of space, storage, back-road capability, and ease-of-use (compared to the larger SE campers with a slide-out dinette and shower that add complexity to the system). 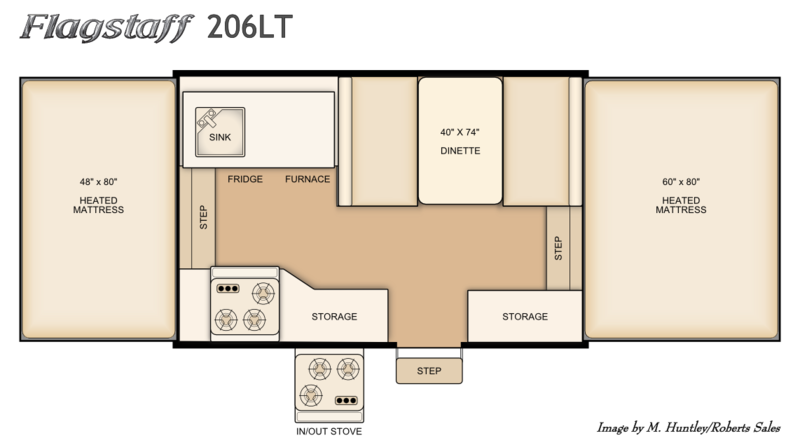 This is a nice floorplan in a relatively small package (12' box). The front dinette is big and easily hold four adults while the rear bunk offers a spring mattress. And if you haven't been inside a T-Series yet, we recommend checking one out--they have a completely different feel to them than a tent trailer. One drawback to the T-Series in general is the lack of headroom at the ends of the camper. The is the T12RB interior with a storage trunk on the front. It adds only 70 lbs. to the weight of the trailer and offers a big box of storage space on the front. The front dinette and rear bunk dinette layout is highly functional. It must be popular, too, because this is the third variant based on the T12RB! The T12BH has the same interior as the T12RB and adds a front "bike hauler" storage trunk and the Sports Enthusiast 15" wheels and higher clearance. The bike hauler is useful for bikes, naturally, but it's also perfect for holding a generator, firewood, chairs, a tool box, big plastic totes, etc. One minor drawback to this model is the addition of a dormer in 2017. We're not excited about the extra weight, set-up steps, or $$ the dormer entails, especially given the mere 6' 1" clearance it provides. Admittedly, though, the extra head space in the dinette area is nice. The is the T12RBST with 15" wheels, mud-tires, and a 6" main frame--a Sports Enthusiast edition of the T12RBST. It weighs 130 lbs. more than the T12RBST. This model--new in 2018--takes the T21TBHW and fixes the cassette toilet problem in that the T21TBHWSE does not have a cassette toilet. Instead this model has a regular dinette that folds into a 50" wide bed with a portable toilet under the seat.It retains the T21TBHW's twin bed/king bed conversion feature and adds the Sports Enthusiast Series' gray body, raised frame, and 15" mud tires. Flagstaff's first 14' T-series. It's also a High Wall so the countertops are at a much more agreeable height than the low-wall T-series. 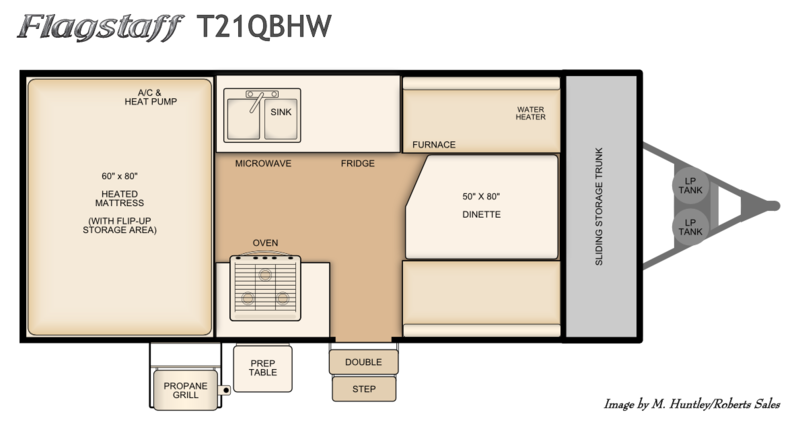 The T21QBHW has room for a double-pan sink, an oven/stove combo, and the 4.0 cu. ft. fridge found in all High Wall models. It also has a queen bed in the back and a 50" x 80" front dinette. It takes the best of the T-series and the best of the High Wall features. The only drawback we see to this model is the length. With the storage trunk on front the frame is 16' long; with tongue and bumper the entire camper is exactly 21' long. The 228 itself is a great floorplan but the shower version goes on the "more specific use" list because the interior shower is not for everybody. It takes up a large block of space and cuts into some of the gallery floor space the 228 without shower has. We understand the interior shower is a valuable feature to some people but we prefer the shower (and especially the toilet) to be left outside. Speaking of, the 228 (without interior shower) is available with an exterior shower in the hot water package--that may be a good compromise if you're on the fence about the shower issue. Great floorplan, great features, but the interior shower/cassette is not to everybody's liking. Sometimes a Porta-Pottie that's not bolted in is a better alternative (and can be taken outside during the day, like out to the bushes or at least into a screen-room or other enclosure, and brought in at night). The non-shower version of the 228BHSE offers a hot water package option that includes an exterior shower which might be a good compromise. The 23SCSE has an interior shower/cassette toilet which only appeals to some of the campers out there but it also has a 4 1/2' deck on the front for hauling ATVs, bikes, or other fun toys. Since hauling toys isn't useful to everybody this model qualifies as a "more specialized purpose" camper. Functionally this is a decent layout with many features. One design issue we frown upon: the 64" dinette. For many people a 64" dinette is not comfortable and when it's made into a bed anybody over 5' 2" would need to sleep diagonally. The 28TSCSE has almost all the same features as the 23SCSE but the deck on the front is 8 1/2' long instead of 4 1/2', has two axles instead of one, and has a 72" long dinette. It's nice that this Sports Enthusiast model has the appropriate size dinette but the interior shower/cassette toilet and the toy hauling deck on the front make this a "more specialized use" camper. Other than these two features that may not be useful to some folks, the design and layout of the 28TSCSE is well thought out. The 425D was formerly in the "All-Around Great" section but Flagstaff changed the sink and stove configuration (which cost a lot more than before) so now the 425D is on the "specialized" list. This model has a wide-open floorplan and the front seating area is nice because you can sit down without having to scoot into the slide-out dinette area (plus there's a Porta-Pottie hiding under the front seat). The bay window contributes to the "airy" feel of the layout but the cabinets below the bay window are only half-depth because of it. Overall a nice floorplan with easy access to the whole camper but it's pricey compared to the equipment that comes with the 625D and 627D. The 1999-2016 823D was in the "All-Around Great" section because it had four large beds and no interior shower/cassette toilet. The 2017 redesign exchanged the rear bed for a front seat (like the 425D) and a baggage door leading to a 110V-only cube fridge. While that may be handy for tailgating it means there are now two very similar models (425D & 823D) with only three beds but no four-bed/no interior shower model. As a result we asked Flagstaff to special-build the 825D for us. 1. The interior shower/cassette toilet is not for everybody. As the largest low-wall Classic the 627D certainly has a lot of space to stretch out. However, it also has an interior shower/cassette toilet (which may not appeal to everybody) as well as an abbreviated sofa/bed that is only 62" long. If four beds suited for taller people are required, this model comes up short (tee hee). The outside-access fridge is an interesting idea but the fridge is 110V only (not a 3-way fridge like the interior fridge) and we're curious how many of those little cube fridges will end up in the garage or someone's college-age kids' dorm room and that space used for extra storage instead. The High Wall campers are packed with near-travel-trailer amenities and are quite luxurious for camping trailers but there's a few issues to keep in mind: the camper (when folded down) is higher than the view from a rear-view mirror of almost all tow vehicles (including our full-size trucks) so the traditional tent camper benefit of being able to see out the back window is no longer and you have to rely on your side mirrors, and the sidewall of the camper is a full foot taller than base pop-up sidewalls and the "feel" inside the camper is different than low-wall campers. We recommend checking the High Wall campers out in person to make sure you like the feel of it. This is a 14' High Wall T-series camper with three separate beds (two twin beds and a dinette that folds into a third bed). It also comes with an extra bed piece that spans across the two twin beds to create the largest bed of any Flagstaff pop-up camper (the combined bed measures 80" x 74"). In theory this should be on the "All Around Great" list, but the odd placement of a cassette toilet right next to the dinette--which also forces the dinette into a strange three-person/half-table configuration--places the T21TBHW squarely in the "Specialized" category. One other note: in 2018 Flagstaff added a dormer to the front of this model. We're not excited about the extra weight, set-up steps, or $$ the dormer entails, especially given the modest 6' 4 " clearance it provides. It's good to offer a small 8' camper but the 176LTD has a problem: the dinette. It's a 64-incher to start with but more troubling is the placement of the wheel well. There's no way to move the wheel well location, of course, so the wheel well is simply covered with two boards that protrude into the dinette's leg area by 12" (out of 34" total). The wheel well cover means that only two adults can sit at this dinette (two small children could presumably put their legs on the cover). If towing capacity demands a 1344 lb. camper this may work for two people or a small family but for only 150 lbs. more the 206LTD (1493 lbs.) is a much better solution. This is the Sports Enthusiast version of the 176LTD with a minor twist: the dinette has been reconfigured in "L" formation to eliminate the 176LTD's wheel-well problem. However, to make the dinette accessible from the galley (sink) side, Flagstaff shortened the table into a bistro-style 18" x 20" platter. It could be argued that a camper is mostly a place to sleep and a tiny table doesn't matter, but if it rains and a meal needs to happen inside the 176SE, that table could be a problem. Playing board games on that table may also prove difficult. Adding a separate camp table or portable table may help with this issue, but it's still a hassle. The dinette pulls out to make a bed, but it loses an inch to the already-small 176LTD dinette/bed. 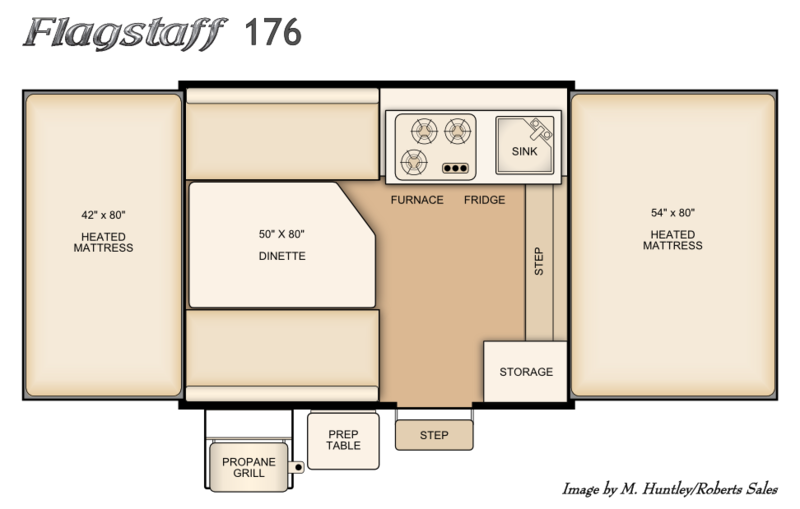 At 63" long the 176SE has the shortest dinette/bed of any Flagstaff pop-up. 1. The dinette is only 64" long and is partially blocked by a wheel well cover that protrudes into the dinette's leg area. 2. 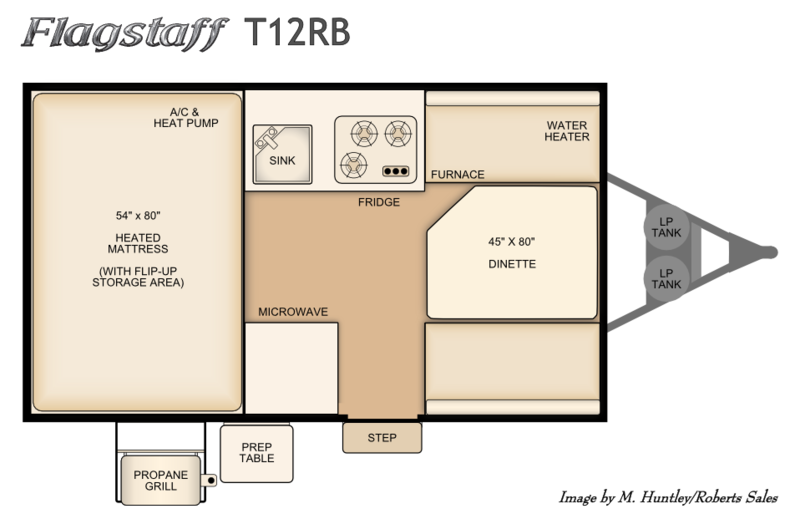 The storage area under the galley is taken up by the water heater, water pump, and water filter--the only viable storage space in this camper is under the two dinette seats and in one pull-out utensil drawer. 3. The fridge is separated from the rest of the galley--not a very good work triangle. The lack of storage cannot be overstated. We strongly encourage anyone considering the 205 to see if the 228 with shower might be an acceptable alternative (the 228 with shower weighs 281 lbs more--2278 lbs dry). 1. the slide-out dinette is only 64" long so it might not be comfortable for some people to sit at and when it's folded into a bed (thus anybody over 5' 4 " would have to sleep diagonally). 2. One of the appealing features of the 228 and 228BHSE is that the gaucho/bed is across from the dinette such that meal time or game time can be shared by 6, 7, or maybe even 8 people. With a slide-out dinette this isn't possible (not only are the two seating areas too far apart but the slide-out dinette is elevated 6" to accommodate the slide-out hardware). Two separate areas might be beneficial in certain instances but it decreases the flexibility offered by having the couch and dinette together. 3. The 12' MAC campers are 4" shorter in the sidewall than their Classic counterparts. Why that matters with a slide-out dinette is that the dinette cushions that fold down to make the bed can stay in bed format on the Classic campers, but they have to be moved on the 228D with four less inches of clearance where the end-bunks slide in. The two seat-bottom cushions can fit under the dinette table (though that space on a Classic can be used to store other gear) but the two seat-back cushions have to fit between the slide-out dinette and the gaucho after the slide-out dinette has been pushed in. Granted, this is a minor irritation, but it's an issue the 228 (if a slide-out dinette is not necessary) and the Classic Series (if a slide-out dinette is necessary) do not have. This model has the same layout issues as the 228D but with an interior shower/cassette toilet installed in the front door-side corner. The interior shower/cassette toilet is not for everybody; a hot water package with an outside shower might be an acceptable alternative if you're on the fence about showers. 1. The dinette is only a 64-incher and the wheel well cover takes up a lot of space in the dinette's leg area. The sofa is 62" long. When folded into beds anybody taller than 5' 2" might have a tight squeeze. 2. 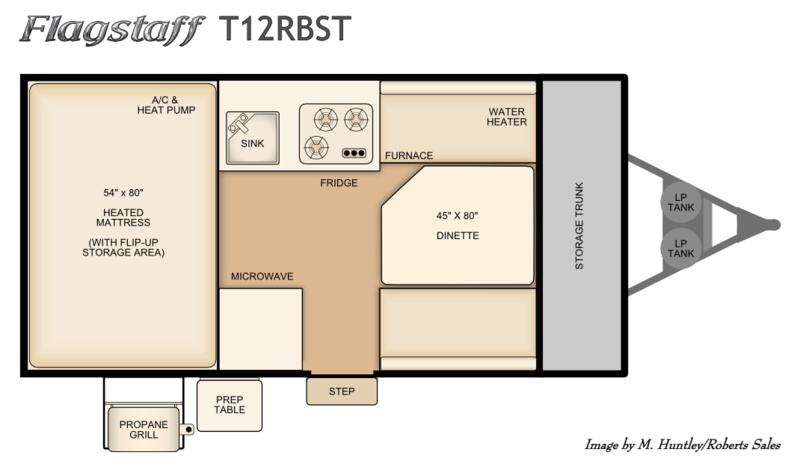 Because the seating areas are at diagonal ends of the camper the galley is split into diagonal corners as well; the fridge is on the opposite corner from the sink and stove. If two people are sitting on the couch and somebody else is trying to cook dinner and needs something from the fridge then one person on the couch must angle their legs to make a path through that bottleneck. If the gaucho is needed as a bed (for people shorter than 5' 2") the bottleneck problem becomes even worse. With the gaucho as a bed, anybody going from the back bed, dinette, or galley area to the front bed, fridge, or door have to step over the gaucho bed corner. I suppose this layout would work with one or two people but it seems like a hassle for larger groups. If two separate seating areas is the goal the 208 does a much better job. If someone wants the Sports Enthusiast package in a 10' box, we recommend the 206STSE. If the storage trunk on the front of the 206STSE or the lack of a fourth bed is a deal-breaker and high ground clearance is a must, we suggest taking a 208 and adding a raise frame and 15" wheels. KS stands for "Kitchen Slide" and means that a mini-galley with sink and stove slides out of the side of the camper so you can wash and cook outdoors. Although there are times when a sink on the outside of a camper would be handy, the amount of space that the slide mechanism takes up and the added weight to the trailer (150 lbs--for that?) seems like a bad trade-off. If a cooking and washing hands on the outside of the camper is vital, we'd recommend the lighter, less expensive, and simpler HW27SC which has a grill on the outside and an exterior shower for hand-washing. One other issue is the placement of the step. The step on the HW27KS is 2 1/2' closer to the front of the trailer than the step on the HW27SC. This has caused several bent steps because the farther away the step is from the tires, the greater the "dip" angle when the tow vehicle goes through low spots on the road. Having a step farther back like on the HW27SC protects the step much better. Lastly, the wrap-around dinette is less useful than a regular dinette (please see Not All Dinettes Are Created Equal). Taken as a whole, we believe the HW27SC is superior to the HW27KS in every aspect except the "Is The Sink Outside?" category. The High Wall campers have higher sidewalls that affect the "feel" of the interior (it feels a bit more closed-off from the outdoors) and that doesn't necessarily work for some people. Also the HW29SC has a wrap-around dinette and that's not always the best way to go when acting as the primary dinette area (please see Not All Dinettes Are Created Equal). Mostly our problem with this model is the sofa/bed: at the expense of the two extra feet of box space, a second axle, 300+ extra pounds, and a lot more money, the HW29SC provides--essentially--one extra bed over the HW27SC. The problem, though, is that this bed is only 43" x 60". It seems like a lot of extra weight, money, and ungainly-ness for a five-foot bed. For all these reasons we recommend the HW27SC over the HW29SC. This was Flagstaff's first foray into T-series dormers. The dormer was meant to provide a horizontal surface to mount the shower curtain (since the previous method of attaching the shower curtain to the non-dormer, angled roof was with pieces of velcro and an angle-cut shower curtain found in the T19SCHW). However, the dormer has only 6' 4" of clearance so the shower still leaves a lot to be desired for taller folks. The extra weight, set-up steps, or $$ the dormer entails does not help its case, either. 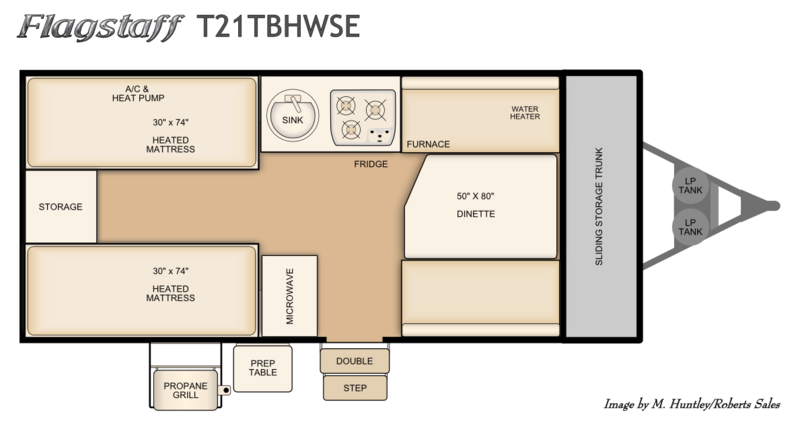 So the dormer is not ideal, but the main reason the T21DMHW is on the "niche" list involves the dinette. It is a 33" x 64" dinette--the smallest dinette in any Flagstaff pop-up camper. This may work for two smaller people but it will most likely be uncomfortable for anyone over 5' 6" or so. And if a camping trip requires a second bed, the 5' 4" dinette bed may be a limiting factor. That being said, it's possible this model would be perfect for one or two people who need an interior shower and perhaps if most meals are eaten outdoors the size of the dinette won't matter.